Rates are rocketing up and business owners sitting on debt tied to an adjustable rate should be very worried. The Federal Reserve has shown little reserve when it comes to raising their target rate, which directly affects the Prime Rate and many mortgages and other types of debt are tied to Prime. If you’re a broker or business owner, and you agree that interest rates are going up for the foreseeable future, you can protect your clients or yourself with a fixed-interest SBA 504 or Liberty SBF Conventional loan. Before we get into refinance options, it might be good to compare the two types of rates and show the cost benefit. With a variable rate mortgage tied to the Prime Rate, like an SBA 7a loan, the monthly payment will rise as rates go up. 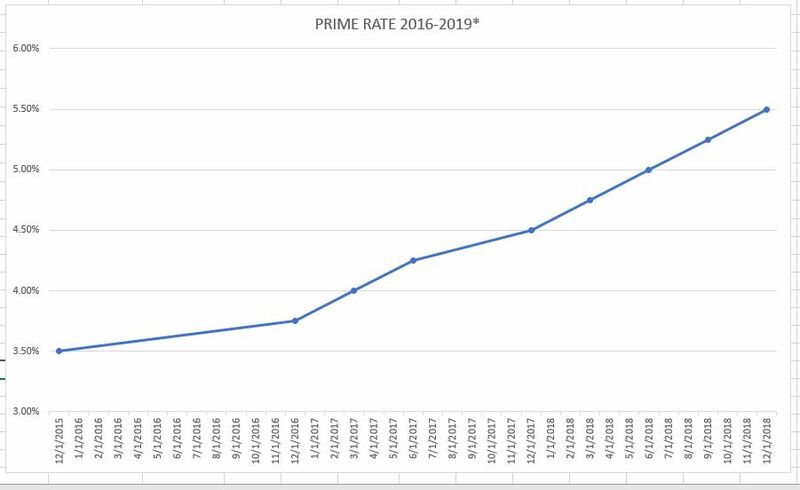 According to the SBA, there is about $113B in 7a loans outstanding making up a major portion of the owner-user debt on commercial real estate in the U.S. Tracking the Prime Rate you can see how it’s risen over the last three years. On the other hand, the rate on an SBA 504 loan is fixed so that, for the term of the loan, the rate does not change. Using a $1MM mortgage as an example, let’s compare the payment on an adjustable SBA 7a loan tied to the Prime Rate to that of a fixed-rate loan. A business owner would see a significant increase in their monthly payment in a very short time, from $6,443 to $7,553, a $1,262 per month increase. Comparing the above scenario to a fixed rate, a borrower would see a savings of $1,262 per month in a fixed rate loan when compared to the adjustable SBA 7a. And, the longer you wait, the more it might cost you or your client as rates continue to rise. As we mentioned before, you have options. In 2016, an act of Congress made the debt refinance aspect of the fixed-rate SBA 504 Loan Program permanent. The enhancement was made to help small business owners ease their financial burden. As we saw above, a long term fixed-rate loan can help refinance debt from adjustable rate loans with significant savings to borrowers. The refinancing loan is structured like SBA’s traditional 504 loan. A borrower can leverage up to 90% of the value of a commercial property to pay off qualifying debt. An SBA 504 loan is made up of a first and a second lien. A lender provides up to 50% of the value of the property on the first loan and a non-profit organization authorized by the SBA called a Certified Development Company (CDC) funds the government guaranteed second loan up to 40%. Let’s break it down using a property appraised at $5MM as an example. The owner wants to refinance a mortgage on a commercial property plus working capital. The SBA 504 refinance loan is a great way for business owners to fix in a long-term rate on a commercial property and provides plenty of other great benefits. There are some instances where an SBA 504 loan can be ineligible. First, an SBA 504 loan cannot be used to refinance an existing government guaranteed loan like another SBA 504 loan or an SBA 7a loan. Only conventional loans are eligible, like a bank loan or CMBS. Also, if a business needs more than 20% LTV in working capital then the SBA 504 Loan Program is ineligible. As an alternative, there are conventional owner-user loans programs available and each one is slightly different. We will use Liberty SBF’s Conventional Loan Program as an example, which was created specifically to meet the needs of business owners who can’t go with an SBA 504 loan refinance. With a majority of the variable rate debt on owner-user commercial properties coming from the SBA, the most common scenario is when a property owner needs to refinance an SBA 7a loan to a fixed rate. Since the SBA 504 program is ineligible to refinance a government loan, a conventional loan will do the trick. Liberty SBF’s Conventional Loan Program was designed with this particular situation in mind and in almost every way it is identical to the SBA 504 loan. The property still needs to be at least 51% owner-occupied to be eligible and an owner can still take cash-out for business expenses if needed. The maximum LTV is a little lower on a conventional loan across the board. Liberty SBF has a maximum 70% LTV on multi-use property types and 65% on hotels and special-use. While all loans are subject to underwriting approval, Liberty SBF’s conventional loan is a more flexible product for deals outside of SBA 504 eligibility. The cash-out portion allows for one of the largest variances. A Liberty SBF conventional loan has no maximum LTV restrictions on cash-out as long as it is within the maximum LTV range of the property type. When compared to the SBA 504, which allows only up to 20% LTV on the cash-out portion of a loan, this is a huge advantage for business owners who need to draw more capital out of a property. With the SBA, working capital must be specifically tied to expenses that are incurred within the business being run from the property. Liberty SBF’s conventional loan allows proceeds to be used for other approved purposes, like the purchase of another owner-occupied business. Of course, the main focus of the program is to refinance out of adjustable rate SBA 7a debt into a fixed rate option and help business owners control monthly expenses, something the Liberty SBF Conventional Loan program does very well. We’re not making any predictions here but it seems that the days of ultra-low interest rates have ended for the foreseeable future and if past is prologue then rates will continue to rise, along with a business owners’ monthly cost of capital. Companies need capital to grow. Both the SBA 504 and the Liberty SBF Conventional loan programs allow owners to take advantage of the equity in a commercial property at a fixed-rate to control rising monthly payments and expand their businesses. Talk to us about options to refinance a rising adjustable rate commercial real estate loans into one of our fixed rate programs. And, as always, we’re more than happy to help. Email info@i.libertysbf.com or call (213) 297-5747.